Looking for tents? Check out our Buyers Guide! Home sweet home for two. A high-quality two man tent is the perfect retreat after a long day of climbing or trekking. It offers protection against wind, weather and insects. After a restful night in your 2 man tent, you're ready to set off on new adventures. The ideal 2-person tent for each and every application has not yet been invented and probably never will be. Should it be light or heavy? Should it have large vestibules or should it be low profile against the wind? We offer a wide range of 2 man tents for all your wants and needs by renowned manufacturers such as Vaude, The North Face, Tatonka and Salewa, and genuine specialists like MSR and Exped. If you travel by car you can reap the benefits of a spacious 2-person tent. They offer a lot of room for your equipment and provide shelter for days of bad weather. The other side of the coin is their increased weight compared to more minimalistic models. Backpackers who carry their tents over long distances will acquire a liking for lighter models sooner or later. Ultra-light doesn't always have to mean less comfort. State-of-the-art materials make the production of compact, lightweight tents with generously-sized vestibules possible. These products are ideal if you like leaving the trails for a few days and carrying all of your equipment on your back. Since it is designed for two persons, the burden of carrying the tent can be shared. People often ask themselves if they should just go for a 1-person tent. So a light 2-person tent can be a sensible compromise between flexibility and weight. Tents come in different designs, the most common of which are the tunnel tent, the dome tent, and the geodesic tent. These designs mainly differ in terms of interior size and storm resistance. There are single-walled designs and models that combine inner and outer tents. 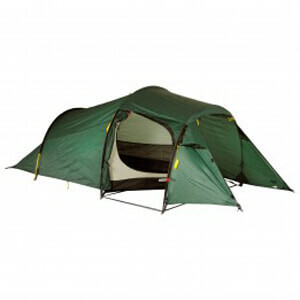 Two man tents with an inner tent are particularly suitable for hot areas. For example, you can pitch only the inner tent and use it as protection against mosquitoes. Other features include ventilation and frames. Our customer service team members have personal experience with all types of 2 man tents and will be glad to answer any questions you may have.